Having gone to school in D.C. a semester, living in Arlington for almost a year, and Mom traveling to D.C. for work frequently, we have been to the Reagan Airport with Mik almost yearly over the past decade. Until this trip, though, we had always flown American for our D.C. trips. Now that we live in Huntsville we would have had to fly to Dallas to get to D.C. on American and that was much more expensive than taking the direct flight on U.S. Airways, which at least now also gets us American miles so seems a win-win. What I did not realize until I checked in the day before the trip was they only fly little planes between Huntsville and pretty much everywhere on U.S. Airways and American (only to/from Dallas uses big planes, but even then not every flight). Mik absolutely hates the little planes and as much as he also hates Southwest he preferred that over the American Eagle flight between Tucson and LA. We even tried to fly through Alaska to get home from Hawaii a few years back to avoid LA and were quite annoyed that they then changed our flights to go through LA shortly before our trip. Mik's problem is the aisle chairs do not work well on the little planes, but since they are hard to avoid living in Huntsville Mik has gotten used to having to just sit in bulkhead. Landing at Reagan and hearing the flight attendant say a shuttle was meeting the plane put him right back at hating little planes. 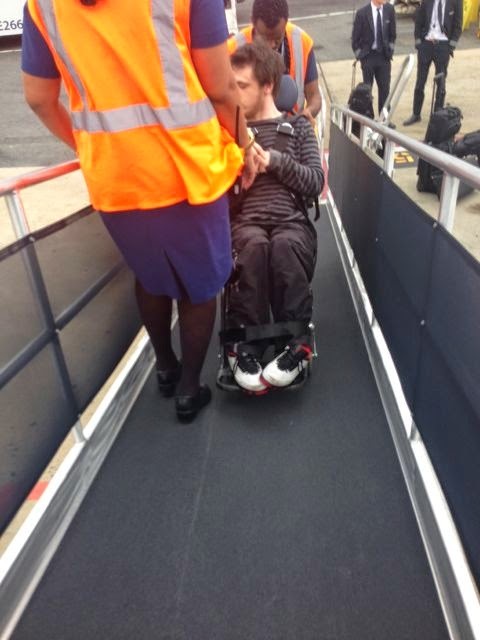 It was mostly the unexpected experience of suddenly hearing about stairs and him not being able to see that a ramp was waiting to be brought up to the plane, but it was also about him hating buses. Mom was waiting in the terminal for us having not been able to get home the day before and travel with us as usual and her reply to me telling her Mik was freaking out about a shuttle bus was something like yeah they usually do that here. That made Mik even more annoyed because he totally could have been mentally prepared. 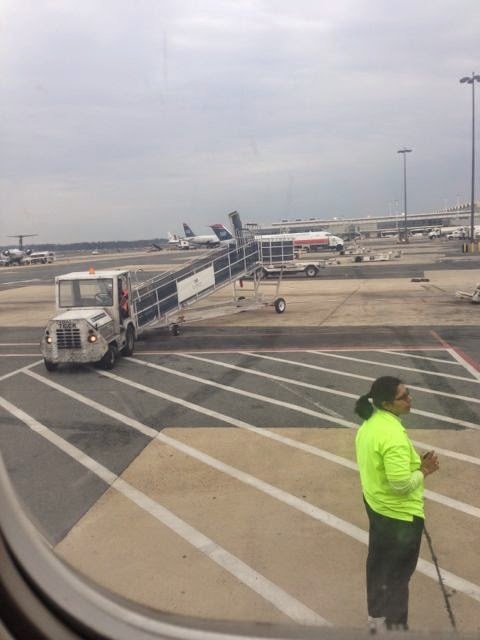 Despite the shuttle bus, overall the experience at Reagan Airport was actually very good. For one, their aisle chair is the more common one than the one in Huntsville and it actually fits in the aisle. Mik also likes that there is a companion bathroom located right inside security in each terminal (or at least the two of three we have been in and assume the other is identical since those two are). The little corral for those needing to pre-board was slightly annoying in that it was crowded, but it did serve a good purpose in that they were very helpful in making sure those that needed help got it including informing us that our flight was moved to boarding upstairs at the actual terminal and offering to help going there.